The Cheese and I finally had the time (and moolah) for Katsu Sora's version of tonkatsu set. I could tell the Cheese was feeling extra gracious that day when he ordered the top grade and most talked about Iberico Pork and Kurobuta Pork. My, my, your tonkatsu perspective will certainly change after consuming the Iberico and Kurobuta. Mapapa-"Tokyo Tokyo whut" kayo. Katsu Sora is located at 2nd floor of the Promenade in Greenhills, sitting right beside Santouka Ramen (they both have the same owners). Before our finest tonkatsu sets arrived though, we had to deal with their salad and fruit bars first. And oh, let's not forget the soup too. You can get unlimited servings of both when you avail of any of their Tonkatsu Sets. 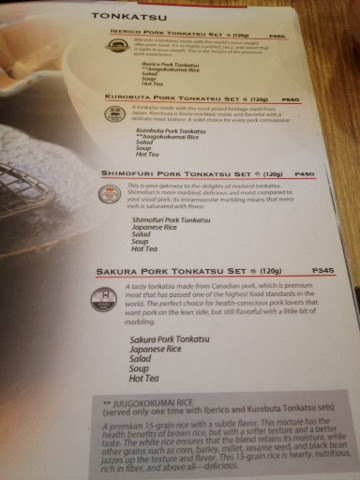 Katsu Sora serves 4 kinds of pork. There's the Iberico, Kurobuta, Shimofuri and Sakura. The Spanish Iberico pork is uniquely Katsu Sora's, the elite among the four. The Cheese got the Iberico while I had the Kurobuta. Bite into a tonkatsu made with world's most sought after pork meat. It's so highly marbled, juicy, and sweet that it melts in your mouth. This is the height of the premium pork experience. PhP655. It was my first time to have the kurobuta pork. Even Yabu's kurobuta I haven't experienced yet. Kurobuta is considered as Japan's most prized meat. If España has their pata negra, Japan has their kurobuta. A tonkatsu made with the most prized heritage meat from Japan, Kurobuta is finely marbled, moist, and flavorful with a delicate meat texture. A solid choice for every pork connoisseur. PhP550. I think ordering both Iberico and Kurobuta porks was a bad decision. I had no idea how to differentiate the two!! Although if compared to other tonkatsu sets we've had, these two are definitely topnotch. They weren't exaggerating when they said how soft it was it actually melts in your mouth. It was really tasty. The Cheese, ever the kitchen master between us two, showed to me why it was so special. Look at the marbling! That is not something that can be easily achieved here on a regular basis. We both loved the Juugokokumai Rice - 15-grain rice - that came with our tonkatsu (regular Japanese rice when you order the Shimofuri and Sakura porks). The ritual of grinding the sesame seeds is extremely satisfying. At least on my part it is. Thank you to my beneficiary! Til our next date, the tonkatsu war awaits.